Note: all the below steps are done by HANA SYSTEM user. If you use other HANA user, you may grant the roles/privilege if needed. 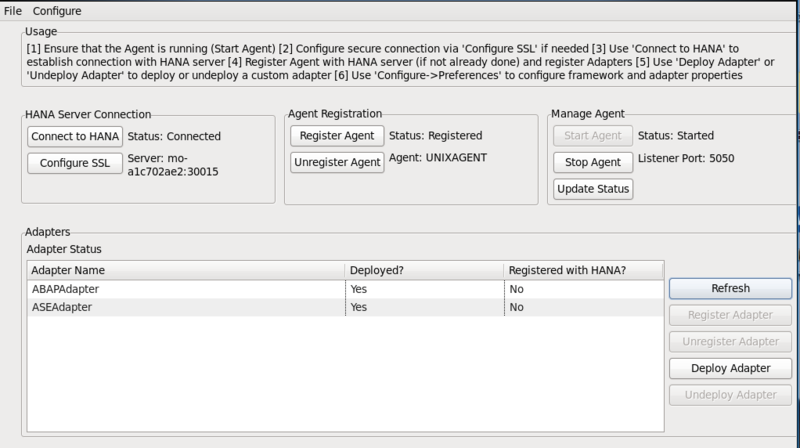 Download HANA SDI 1.0 and install Data Provisioning Delivery Unit. You could use the UI in this Delivery Unit to monitor the replication task status later. Note: you may install the agent in a separate Linux server. Log on Linux server using root user. Add one new OS user name with dpagent. –path: specify the directory of dpagent installation. Start Xming on your terminal server. Now we need to register the HiveAdapter distributed by SAP. Now let’s configure the HiveAdapter. Note: please download one version of 0.12.0, 0.13.0 or 0.13.1. After it’s executed successfully, then you could preview the data in your local table. You could also monitor the Data Provisioning Agent and replication tasks in the UI of Data Provisioning Delivery Unit you imported in the above. Where as windows version lists all adapters.